Sweden has one of the world’s most controlled alcohol regimes, with steep taxation, a state-controlled retail monopoly, and a 20-year-old minimum age to buy alcohol at a store (and they really card, too). The only store at which a consumer can buy wine, beer, or liquor in Sweden is Systembolaget, the state-controlled retail monopoly. Is this a good thing or a bad thing? My intuition (and that of the economists I’ve been speaking with here in Stockholm) is the latter—first and foremost, as in Quebec, it’s a major headache for wine producers, whose distribution chances hang on the (often arbitrary) whims of just one decisionmaker. Opening hours of stores are criminally short. Pricing is screwy, in part because per-unit (rather than per-krona) taxation results in cheap wine being overpriced and expensive wine underpriced. As ever, monopolies throw everybody’s incentives out of whack. But here’s one definite consumer-oriented boon that results: in an of-the-people move, Systembolaget wine stores—that is, all wine stores in Sweden—are organized first by color, second by price. 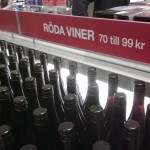 There’s the 69-kronor-(US$8.71)-and-under red wine section; there’s the 70-kronor-(US$8.84)-to-99-kronor (US$12.50) red wine section; and then there’s the 100-kronor (US$12.63)-and-up red wine section. Although I’ve seen US wine stores with special $10-and-under sections and such, I’ve never seen an entire store organized this way. Intuitively, at least, it seems to be more aligned with consumers’ game plans as organization by region, grape, and so forth. Why don’t non-monopoly stores organize this way? My guess would be that profit-minded stores, for understandable reasons, don’t want to lose the chance to upsell—they want people to walk away with a wine more expensive than the one they came looking for. “Why don’t non-monopoly stores organize this way?” – Because they are customer focused and care about what they client needs. Plus they have an interest in having an intelligent consumer (because, yes, it might entice the customer to choose a better wine – the more you know, the better wines you drink). Another way to look at it: organising by price focuses the mind of the consumer on one single thing: price. 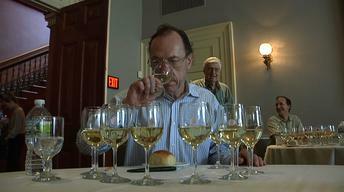 It detracts from more intelligent wine drinking criteria, like e.g. origin, producer, style (well, they’re also organised according to style at SB, but very crude ones). But try walking into a Systembolaget (the correct spelling) store with the mind of buying a good Bordeaux or an decent Languedoc. Where do you start? Well, there’s no easy way to figure out what Languedocs they have (a rather poor selection unfortunately), so you have to first decide what price to pay. You don’t have the possibility to see what they’ve got in that section (the Languedoc range) and then decide how much you’re willing to pay. One more reason to scrap the monopoly. Assuming (perhaps generously) that the high tax is based on the actual cost to society of someone drinking a bottle of wine, it seems eminently reasonable that it would be a per-unit tax rather than per-krona. The externalized costs of drinking that bottle of wine, to the extent such costs exist, wouldn’t depend on the price of the wine but on the alcohol content (which tends to be rather uniform in the US – I wonder if the same holds true in Sweden). I realize that this might seem like screwy pricing if you’re used to the ad valorem US tax but it might actually make more sense. As a long-time exPat in Sweden I have always maintained that people with foreign passports should be able to buy wine wherever and whenever they want, since obviously only the Swedes have severe problems with alcohol and need to be nurse-maided in this patronizing way. 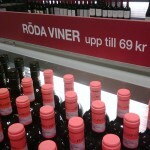 Many Systembolaget stores have double queues when it is busy – one to get into the store and one to pay for the booze. And buying wine and cheese in the same store? Forget about it! Plenty Swedes already drive abroad to fill up with cheep beer and wine, so the heavy drinkers get their cheap fix anyway. The monopoly affects mainly people like me who – heavens forbid! – might want a nice bottle of wine after 7 on Sunday evening without planning an Arctic expedition three days earlier. So Sweden should at least allow speciality shops that sell mid-range beer and wine for a higher price, and stop treating us like children! You wrote “and a 20-year-old minimum age to buy alcohol at a store (and they really card, too)”. Don’t you mean “and they really carE”? Most stores organize both ways to a certain extent. In most cases, the stores I shop in organize horizontally by variety and/or region, and vertically by prices (from the bottom being the lowest, to eye level being the highest price). You may only get three ranges of price (>$10, $11-$20, and $20+) but that’s close enough for me. I want a cheap Chardonnay, I know where to go. I want a nice Cabernet for a good dinner, I can easily find it. This isn’t rocket science. You get this to some degree in some British and French supermarkets, at least the more middle-class ones where it’s worth their while selling US$20-30 wine in the first place. 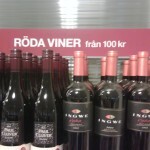 They typically have a separate section for wines over US$15-20 or so, although it’s not explicitly labelled as that. In the fancier stores this section might be tricked out with horizontal racking for the “stock” bottles and perhaps nice wooden sloping shelves to display a single bottle; in lesser or smaller stores the bottles will just be stored vertically on an ordinary bit of shelf. I guess they’re looking to upsell, but to people who already know that they perhaps want a bottle for a gift or special occasion, and it’s easier to sell a $30 bottle if they’ve already got the attention of someone who’s looking to spend $20. To be honest I’d be happy for them to lump all the sub-$7 bottles in another section, to get them out the way. On the tax front – we already have duty based on alcohol content in the UK, about US$30 per litre of pure alcohol in spirits, and effectively about US$20 in beer. 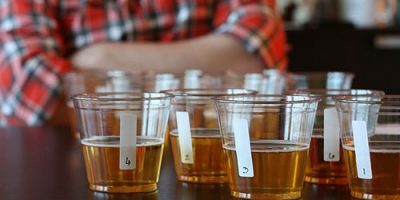 Wine and cider is a bit more complicated with different bands for different strengths. And then we have to add 17.5% sales tax on the value…. The government have also talked about introducing a minimum price of ~US$0.70 per unit (10ml) of alcohol on drinks of all kinds. Becca (11:57 am) I suspect Robin did mean “carD” – as in “check your proof-of-age card”. 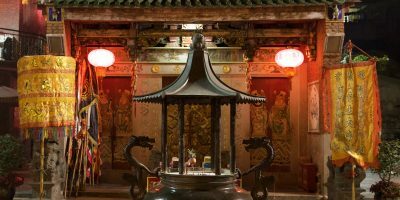 Interesting article! I never knew that they organizes wine by prices, possibly because i’ve never been there. Its an interesting idea and when I tried to think about what products in the United States are organized strictly by price, I realized that there are actually quite a lot. This includes computers, tires, home appliances etc.. there are actually many products done this way. I would like to see more stores in the US organize by this way.